Why should you choose pneumatic tools? Pneumatic and electrical varieties of tools can be found in most stores. And since they look quite the same, it is understandable that the average people who like doing DIY projects get confused about which one to purchase. Both air and electric tools have their fair share of advantages and disadvantages, and it depends on a person’s preference to determine which is better. Did you know that bellows were the very first manual pneumatic tool that was invented way back in 31 CE by Chinese mechanical engineer Du Shi? At present, such air tools are hugely considered as industrial grade tools meant for construction and heavy-duty repair. They are powered by compressed air, and in order for them to function, they require an air compressor. They only consume less power. Air tools are robust due to air compressors that create a significant power as they condense or compress air. On its release and attempt to attain its actual volume, it generates bursts of energy. This excess in energy helps air tools create an exceptional power. In size, they are comparatively small since they don’t have main motors with their body but are powered by air compressors instead. This makes them lighter, meaning they provide a more power-to-weight ratio. Pneumatic tools may be lightweight but are not as portable as they always require having an air compressor; they are significantly heavy and not easy to carry. But know that there are varieties of air compressors that are wheeled or small in size for easy hand-carrying. Given that no electricity passes through, for it is restricted within the motor of the air compressor, air tools are safer to use and do not pose a threat of electrical shocks. Another good thing is that they can be used in wet environments. There is a wide range of pneumatic tools that run using a single air compressor. They are found to have two-stage air compression that compresses air to a larger extent, generates lesser noise, stores air as a reserve, and does not heat that much. They can be used continuously without any incidents of overheating. Pneumatic tools do not require to be maintained frequently as they are more durable because they do not have complex parts. And if maintenance is really needed, the cost of replacement or repair is affordable. To sum it all up, there’s more to pneumatic tools being less expensive as they offer a lot of advantages for users to enjoy. 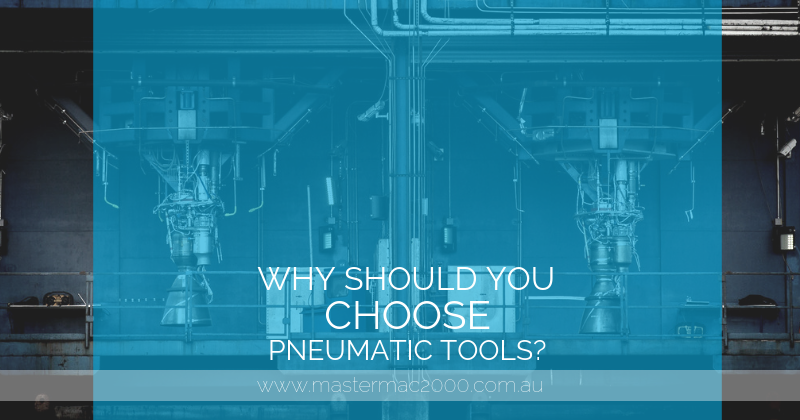 To learn more about pneumatic tools, contact Mastermac2000.com.au.